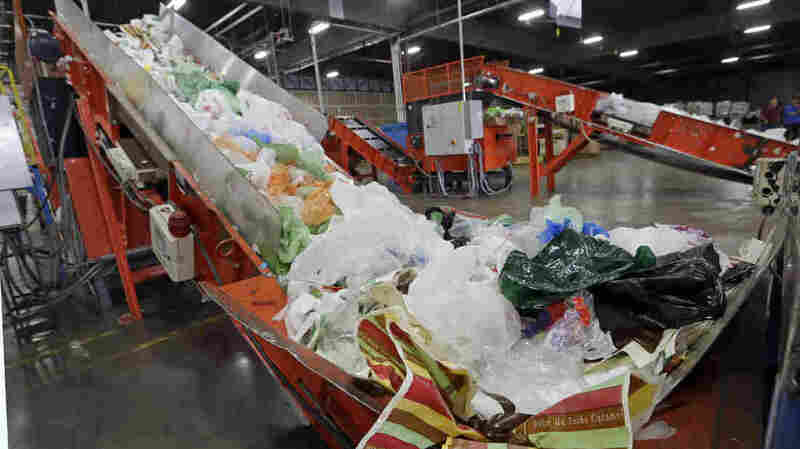 Ban On Single-Use Plastic Bags Is Enacted In California : The Two-Way Gov. Jerry Brown has signed SB 270, the first statewide ban on single-use plastic bags in the U.S. It requires a 10-cent fee for the use of compostable or paper bags. California Gov. Jerry Brown has signed the nation's first statewide ban on single-use plastic bags. Here, mixed plastic items are seen at a recycling plant in Vernon, Calif., earlier this year. The new law requires grocery stores and pharmacies not to distribute single-use plastic bags after July 1, 2015, and to charge a 10-cent fee for paper or compostable bags. Convenience and liquor stores fall under the ban in the following year. While California is the first state to regulate plastic bags, it's not the first government to do so. Dozens of U.S. cities have banned them, starting with San Francisco in 2007. Some, such as Washington, D.C., impose a 5-cent surcharge on consumers who use the bags. Under California's new law, stores will keep the 10-cent fee; they're allowed to spend that money only to cover costs associated with complying with the program. While environmentalists have been enthusiastic about California's plastic bag ban, not everyone is welcoming the new law. "Minutes after Brown announced signing the bill, an industry group called the American Progressive Bag Alliance vowed to begin collecting signatures in an effort to overturn the law via a referendum on the 2016 ballot." Industry groups such as the Retail Merchants Association have complained that plastic bag bans could raise costs for businesses. But as Guillermo Rodriguez of the San Francisco Department of the Environment told WBUR's Here & Now earlier this year, many stores had another main concern. "[The] biggest issue that we had in San Francisco that we learned talking to merchants was essentially, they didn't want to be the individual to have to explain it to their customers why they couldn't have a free bag or why they're being charged," Rodriguez said. That revelation, he said, led the city to ramp up its efforts to explain the ban and its long-term benefits to residents. The bans on plastic bags have survived legal challenges, as in April, when California's state Supreme Court upheld San Francisco's ban.